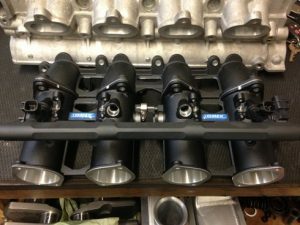 Throttle bodies from 45mm to 50mm with inlet manifold ported to suit your engine, fitted with latest Bosch EV14 injectors and a new fuel rail. 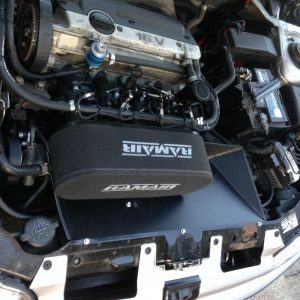 New ecu, and new engine loom custom fabricated to fit your vehicle to include control of anciliaries such as fans and fuel pumps. 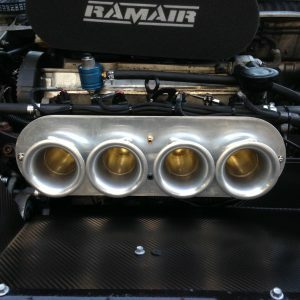 These conversions are very popular on engines such as the Vauxhall C20 XE, Ford Zetec and Duratec, Peugeot XU9 and XU10, but we would also highly recommend fitting a throttle body setup to older style engines that traditionally run on DCOE’s such as Ford Pinto or Lotus twin cams, as the drivability, economy and engine life are vastly improved! Twin Webers and Dellortos are responsible for a huge reduction in engine life caused by poorly atomised fuel and inconsistent AFR’s resulting in bore wash and oil dilution! It is not uncommon to increase engine life by up to 5 times when using throttle bodies over a twin DCOE setup, not to mention the hugh benefit to all refinement including perfect starting, idling and complete mappability of the fueling and ignition timing. In today’s modern world, there really is no excuse to not take advantage of all the benefits a fuel injected throttle body setup gives over twin carburettors! Jenvey even make a heritage throttle body that looks exactly the same as a DCOE, hiding the fuel injector inside the imitation float chamber, for those who wish to keep the authentic carburettor look! The savings in engine rebuilds alone will more than pay for the fitment of a throttle body and ECU setup!